Partial dentures are a great solution for missing teeth. A partial denture rests on a metal framework that is attached to your natural teeth. Also known as a dental implant bridge, a fixed partial denture replaces the area where one or more teeth have been lost. This type of denture does not need to be removed from the mouth for cleaning. It is permanently attached into place to maintain the natural shape of your face. Most patients claim that fixed partial dentures are more stable and comfortable. Our dentist performs a careful evaluation to determine if a fixed partial denture is right for you. 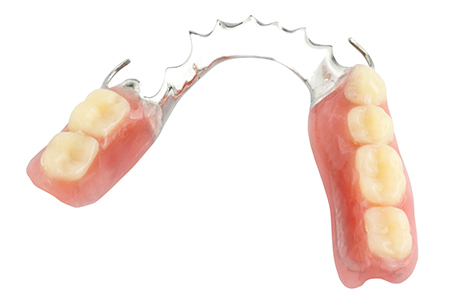 Removable partial dentures consist of replacement teeth attached to a gum-colored base connected to a metal framework. Unlike a fixed partial denture, removable dentures can be taken in and out. Like natural teeth, removable dentures require daily oral hygiene. To clean, take it out of your mouth and carefully rinse off any food particles. Keep your denture in water when you are not wearing it. Our dental team has several years of experience in restoring teeth and creating beautiful and natural-looking dentures. If you’re in need of a new denture or need to replace an outdated one, contact Hendersonville Family Dental today at 828-222-7878. You may also contact us by filling out our online contact form.